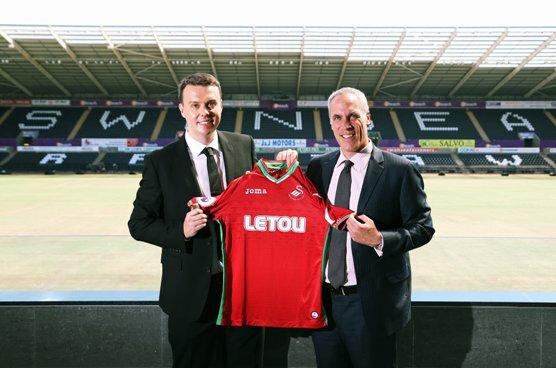 Swansea City’s plans to expand their footprint into Asian territories will benefit significantly from their partnership with shirt sponsor Letou, according to Chief Operating Officer, Chris Pearlman. Letou, the global gaming brand which was established in Asia in 2004, became the Swans’ shirt sponsor earlier this summer, and has a strong presence in some of Swansea’s key target markets such as China, Vietnam, Thailand, Indonesia and Malaysia. Speaking at the launch of Swansea’s new third kit, Chris Pearlman said: “Asia is a key market for Premier League clubs. A quick glance at this season’s Premier League kits and the stadium attendances at the biennial Premier League Asia Trophy demonstrates the importance of the continent. The market is growing, football is becoming more popular than ever and the fans are extremely passionate. Letou CEO, Paul Fox, also expressed his excitement about the deal. He commented: “Although I was born in the UK, I now live in Asia and have experienced first-hand the passion of the fans, making it an important market for Premier League clubs.